One of the most anticipated (or dreaded) stages of traditional publishing is the galley proof. When you're publishing your own book, nobody else is going to send you a printed copy of exactly what your final book will look like (for final proofing, etc., and just for the cool factor). First, I take the "final" version of my manuscript and delete the comments. In the Review tab, when you have a comment selected, the delete menu activates. Pull it down and select Delete All Comments in Document. Next, if you still have any changes tracked in your document (or if you just aren't sure), also in the Review tab, either set the view under Track Changes to Final, or in the Changes group, pull down under Accept and Accept All Changes in Document. Now your manuscript is a clean slate, ready for formatting. Most of the rest can be done in any order, but this is how I did it this time. 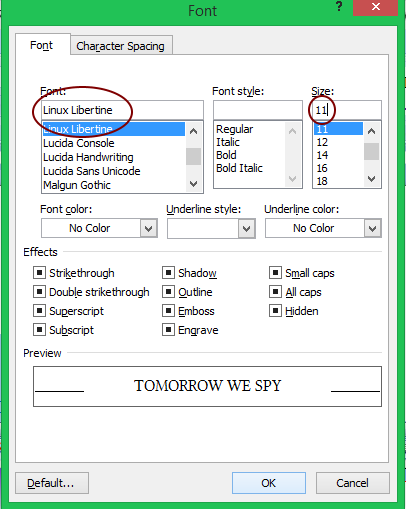 I found a free font, Linux Libertine, on FontSquirrel.com. It's a legible and classic serif font, and I liked their Cyrillic glyphs a lot better than other free fonts'. In general, 11 is a good point size, but this can also be your chance to experiment with sizes. Next, I set up my paragraphs. They should be justified, because this is you glimpse of your story as a "real" book. If you haven't already, set your first line indent (I use 0.25"). 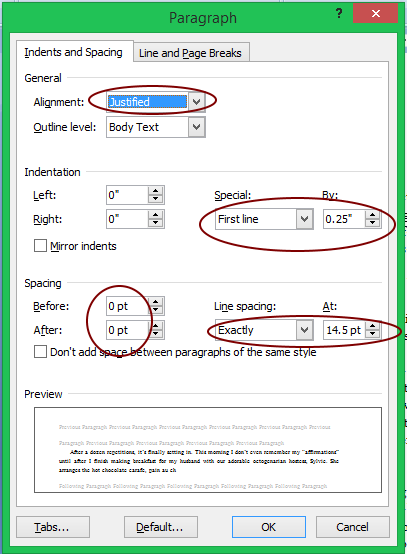 Professionally set books do not have extra space between paragraphs, so set the before and after spacing to 0. You can experiment with the line spacing a bit more. I set my first book at 15 pt and my second at 14.5 pt. Both seem to work. Here's the fun part, where it actually starts to look like a book. Under the Page Layout tab, I change the Orientation to Landscape. I just like having the line between them. Note the Apply to drop down at the bottom of that menu. I selected all the text, so I have it applying to the selected text. 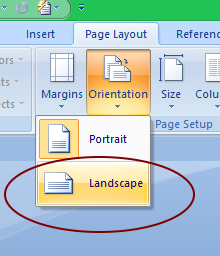 Whole document is another option on this menu if you haven't selected your text first. 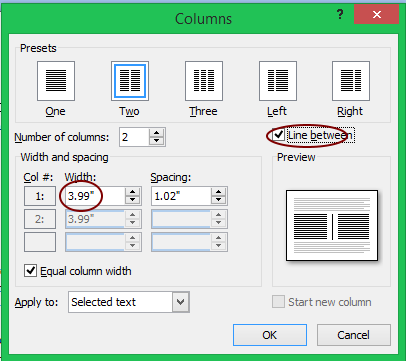 Finally, I replace my manual page breaks between chapters with column breaks. 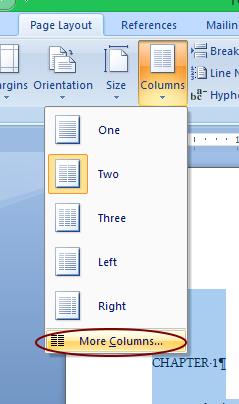 If your chapter text finishes in the first column of a page, a manual page break makes the next column blank. 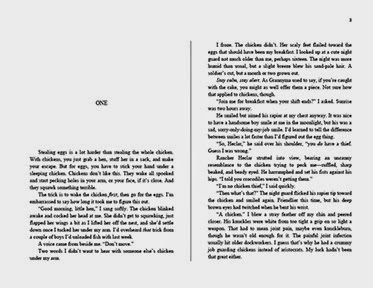 Most trade published books start chapters on right and left pages, and I want to get an accurate count of pages, so I take out the page breaks and eliminate those blank "pages." Why do we bother with this? A small part of it is the fun. Unlike trade published authors, you don't have any of the pressure of turning it around in two weeks or knowing that any changes made after this stage will be charged against you, two complaints about galleys I've heard from authors. 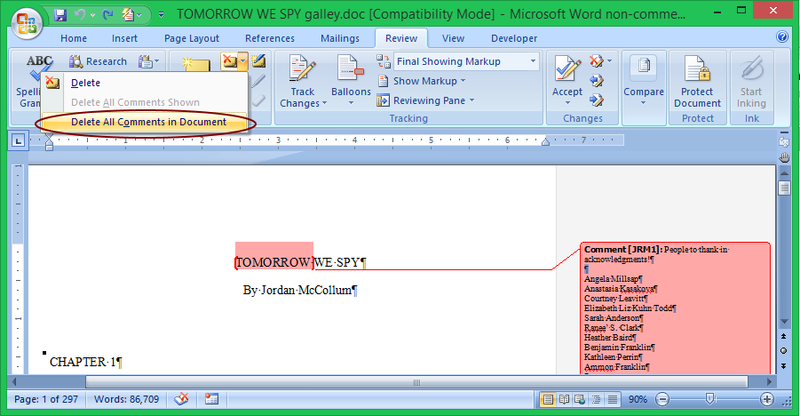 For you, galleys can just be a sneak peek at what your finished book will look like. On the other hand, you do get the pressure of knowing that only you and the people you hire to help you are there to make you look good. I read and proof better on paper (and studies suggest most people read better on paper). Plus, especially if you're doing your own typesetting, this can be a place to look for places where you need to adjust things such as hyphenating a word to fix some weird spacing or rephrasing/editing to avoid "rivers" of white space running vertically across several lines. Both proofreading and a typesetting check make your finished book that much more professional. So definitely take another look at your book before you send your baby out into the world. Hi, Jordan. Thanks for sharing your process. I agree that the result is a good editing tool, in addition to seeing what the final product might look like. Thanks a lot. Great Work!! !